The third stage of Cancer Institute New South Wales’ ‘Pretty Shady’ campaign to provide Sydney-siders with protection from the Australian sun is now under way. A bus shelter with a tribute to the old-school ‘lucky grab’ arcade game, will allow people in Bondi Beach to grab free tubes of SPF50+ sunscreen with a mechanical claw crane. The Cancer Institute NSW campaign, in partnership with JCDecaux and UM, will also include bus shelter wraps and custom roof panels which feature sunsmart messages in bus shelters throughout Sydney and nearby hotspots. Bondi’s unique sunscreen dispenser mechanism is designed to playfully engage passers by and commuters, while spreading the important message of protection from the sun’s harmful UV rays. “Out of home is now more than ever, an active medium that provides unique engagement opportunities that deliver real results,” says Alan Klein, head of creative solutions, JCDecaux. “The ‘Pretty Shady’ activity is the perfect example of how out of home can deliver a real value exchange by providing tangible benefits to those who engage or come into contact with the campaign,” he said. The campaign to stop skin cancer ‘one summer at a time’ also offers free gear including sun protection items such as hats, clothing, sunglasses and beach umbrellas, up for grabs via the campaign’s website. Australia has the highest rate of skin cancer in the world, but avoiding sun damage can stop 95% of melanoma, the deadliest form of skin cancer. The campaign to raise awareness is mainly targeted to a younger audience. 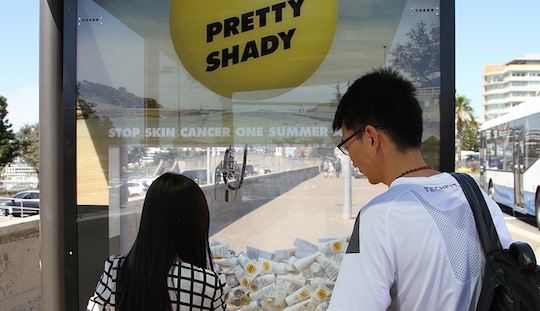 “‘Pretty Shady’ takes a fresh approach to raising awareness and encouraging sun protection in young people,” says Alecia Brooks, portfolio manager skin cancer prevention, Cancer Institute NSW. Here’s a video of the campaign in action.